Here's a sampling of the some of the questions and answers from a Reddit AMA on Seattle's housing market with real estate reporter Mike Rosenberg. Real estate reporter Mike Rosenberg answered questions about Seattle’s sizzling-hot housing market in a recent Reddit Ask Me Anything (AMA). Here’s a recap of some of the discussion. Q: What’s your best guess on where the housing market is going? Bubble? Stabilizing? More craziness? That said, here’s my best guess: The nation-leading price increases have to moderate at some point; every market that’s ever been through this eventually comes back down to earth. Right now, Seattle’s median house price is $730,000. If prices keep growing at the current rate (13 percent per year), the typical house here will be $1 million in 2020, and will get to $2 million in 2026. That just doesn’t seem sustainable. God I hope it’s not sustainable. On the other hand, I think what we’re dealing with here is the New Normal in terms of Seattle being elevated into the upper crust of pricey cities. People who think there is going to be a bubble burst are going to be disappointed, I think. The things that were present during the last bubble aren’t here – people are paying mortgages on time, putting down big down payments, etc. If there is a bubble and it bursts (because foreign investor interest plummets, or Amazon moves out, or some other new issue), and prices drop 26 percent, as they did during the Great Recession, our new home price would be about $540,000. We’ll eventually have a recession – we’re certainly due for one – and prices might even dip a bit. But look around – Seattle is a heavy-hitter on the national stage now. Amazon alone is enough to make the city’s economy among the strongest in the country. I think we’ll eventually settle in and see prices grow and drop a small amount – 5 percent at most – in a typical year. Q: Can we can upzone and build our way out of unaffordable housing, and if we could, could we possibly do it fast enough? If not, whats a solution that doesn’t involve lots and lots of people moving away? As a person terrified that by the time they will be able to afford a down payment housing prices will have jumped another 20-30 percent, do you see anything that indicates pricing could slow down minus a simultaneous crash of Boeing/Starbucks/the tech sector? My dreams went from a single family home to a townhome to a condo over the last three years, and now there’s not even any condos! A: Zoning! The boring but important thing that has a big impact on housing. 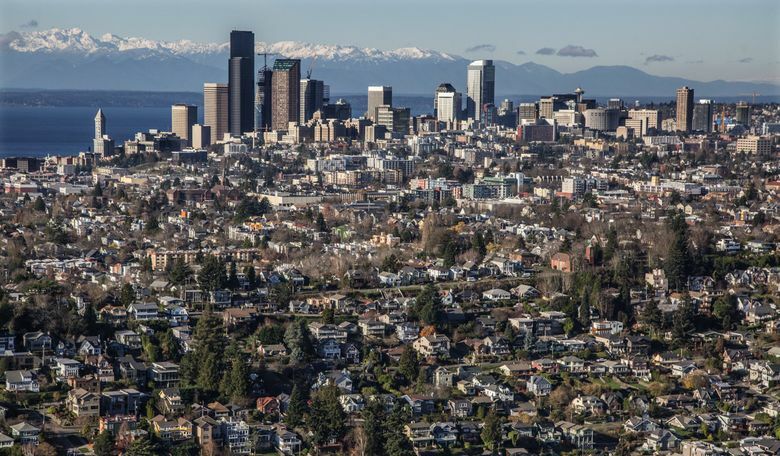 A recent survey found just 29 percent of Seattle residents oppose adding density to the single-family zones that make up a majority of the city, while 48% supported it and the rest were not sure. This is the third rail of Seattle politics, though. Homeowners who want to keep neighborhoods the way they are remain very passionate on this issue and vote more frequently than renters, so they hold a disproportionate share of power in this debate. The last mayor floated a plan to add density to single-family zones and got so much grief he immediately scrapped it. The city, though, has upzoned five neighborhoods and counting in the last year, and things are trending toward taller buildings. My personal thought is the only way out of this is to add more housing, and different types of it (townhomes, apartments, condos, etc) and that means more upzones, but it’s going to be an incremental change, because that’s how these things work. 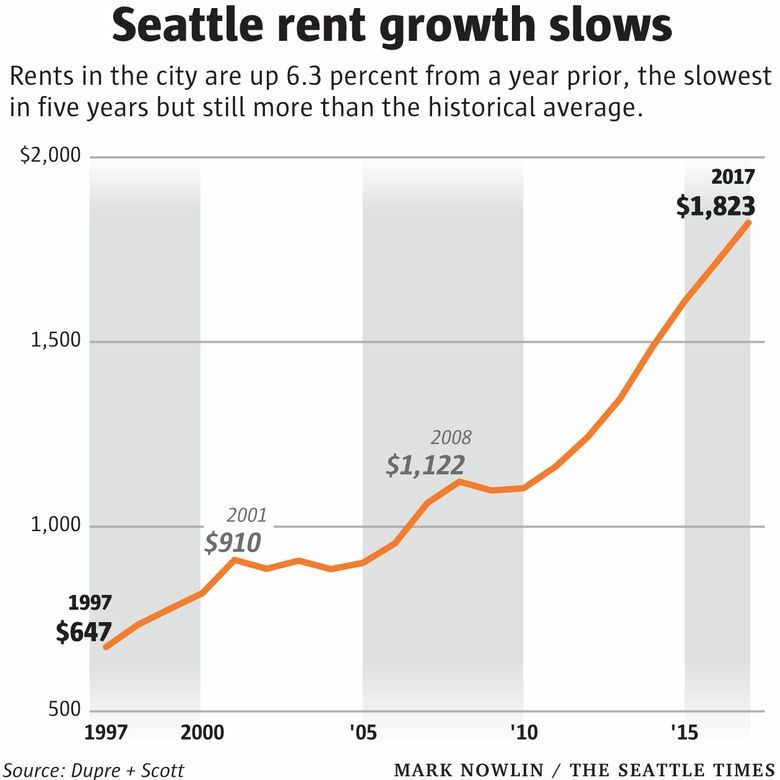 Most cities are dealing with similar issues and Seattle is moving faster than just about anyone. Q: Are there cities that have handled growth well? What did they do? A: It might be surprising to some here, but Seattle gets credit for that – especially in California. Some of the other places aren’t really applicable – Austin and Texas have grown a ton, but they have land to sprawl out, which isn’t going to fly here, I don’t think. Other similar-sized cities like Boston and D.C. are so old it’s tough to compare. In a lot of ways, Seattle is in its own unique spot. Denver might be the closest; they are also a leading contender to get Amazon’s next HQ. Adding more regional transit will be a big deal – that’s obviously a big thing we’re lacking compared to other cities. The upzones are necessary to accommodate growth. I think the city is figuring this out as it goes along and there needs to be a lot of regular check-ins to see what is working, and what isn’t. Q: Hey Mike! Love your twitter feed. Have you thought about doing a companion piece in following the housing market from a buyer’s perspective to doing one from a developer’s perspective? I’d love to understand the process and pitfalls going from a fallow piece of land to one where people live. I’d also love to read more about why there are so few condos in Seattle! A: Thanks! I post a lot of stuff that doesn’t make it into stories on my twitter page. On part 1 – that’s a good idea. I might look into that. My initial sense is Seattle is tough to build in but still better than a lot of tough markets. On condos – yes, that’s a big issue. A lot of people use “condos” as short-hand for the development boom. “Oh, another new condo.” But those are actually apartments – the difference being, you rent apartments, and buy condos. About 95 percent-plus of those new things going up are apartments, not condos, which limits opportunities for first-time buyers, and makes it tough for people wanting to live downtown where condos are the only option to own. Why? Follow the money here – banks issue construction loans for apartments because the rent keeps rising and they keep making a lot of money. Condos are less of a sure-thing following the bubble from a decade ago. Also, Washington has strict liability laws that allow condo owners to sue developers for lots of stuff, so a lot of builders don’t want that hassle/risk – read more about that here. Q: I really want to know what effect the Seattle market is having on the Tacoma market. The feeling is we have people moving down here after they get priced out up north. Can you confirm and how bad could it get for us renters down here? A: It’s happening. The median house in Pierce County is about $320,000, a record high and up 14 percent from a year prior. For rents, Pierce County rents are up about 9 percent over a year ago, so it’s rising faster than King County. In downtown Tacoma, the average 1-bedroom is $1,225. This is a typical pattern – if you think of the market like a dart board, things start going crazy first in the bulls-eye (in our case, downtown Seattle), and then after a while it hits north and south Seattle, then the suburbs on the edges of the city, and so on until it reaches Tacoma. 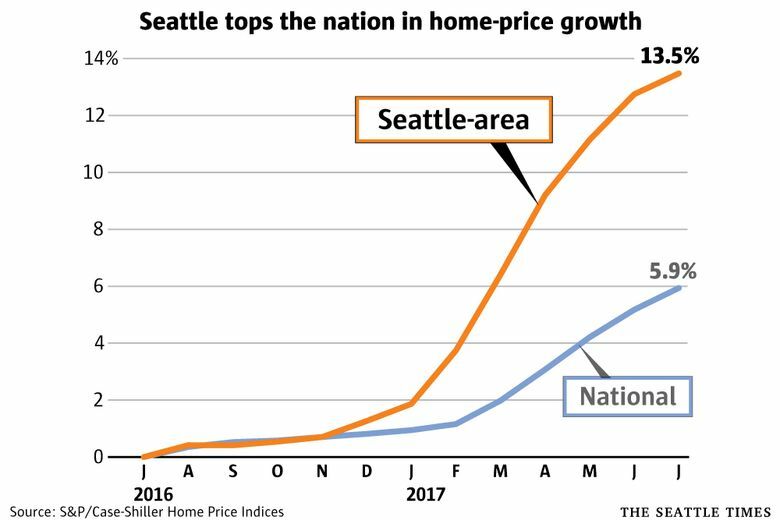 Pierce County just recently surpassed its pre-recession bubble peak for prices, while it happened for Seattle years ago. A retraction would happen in reverse – in other words, if prices go down, they would go down the most in the outlying parts of the region, if this historical pattern holds. Q: How does someone who wants to move manage to buy a new home and sell their current home in this market? I feel stuck. There’s equity, but I can’t use it unless I move into an apartment after selling my house and pray that I can land another one. No telling how long we’d be there, potentially getting stuck and having to settle for less than we have now. In a normal market you could do contingent sales/buys. Any bright ideas? A: Rent-back provisions are standard in home sales now. So people go to sell their home, rent it back from the new owners for 1-3 months, then use that time and equity to go find their new home. This puts a lot of pressure on sellers because they have to find a new house quickly, which is difficult in a market where inventory is at record lows. People wonder: Why aren’t more people selling their homes and cashing out? A big reason is you gotta turn around and buy a home at inflated prices. Q: Any news on how the future light rail build is exacerbating sales up north? Every house around here in north central Shoreline marketed as “close to future light rail” despite the start date being 6 1/2 years out. A: It’s a bigger thing for development at the moment, with builders planning for this by putting up more apartments and denser mini-neighborhoods near light rail. But it’s impacting housing prices, too. Check out the graphic in this story – it shows prices right next to current/planned stations vs. the rest of the area. In Seattle, the median home cost last year was $384 per square foot. Next to the city’s light rail stations, it was $403-$605 per square foot, depending on the station. This echoes studies from other cities. People will pay more to live near transit; in a lot of cases, it could save you money in the big picture because you might not need a car. Q: Mike, would you buy a house in this market today? A: Yes, but I can’t afford it. Once you get the down-payment, mortgage costs are going to be lower here than rent. But it’s tough to save up when the goal posts keep moving. In the last half-decade, home prices have grown 4x faster than pay in King County. Q: How much has rent risen? Now I don’t mean median rent. Seattle has added so many units (all of which on the high end) that the median rent would be increasing even if old stock rent has been decreasing. If we look at any given unit, how much has the rent changed? A: Recently, the rule of thumb was you could subtract 1 percentage point from the rent numbers you see to get the actual rent increase when excluding the new apartments that skew the numbers higher – so if the average rent citywide goes up 7 percent, the actual rent hike facing someone is closer to 6 percent. Now, there are so many new apartments opening up – we’re getting about 25 new units per day, on average – that it’s more like 2 percentage points. The most recent numbers show Seattle average rents up 6.3 percent, but among buildings that opened before 2015, it’s about 4 percent. While we’re here: The mark-up for all those shiny new apartments is about 40 percent. The typical new 1-bedroom in Seattle goes for about $2,000 a month, while it’s under $1,500 for older buildings. Looking for a deal? Skip the new buildings.